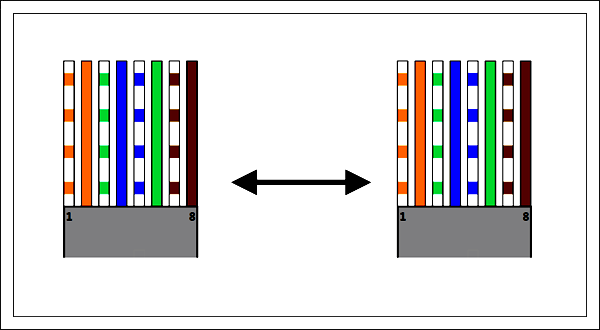 How to make UTP cable? Ethernet is the most widely-installed and commonly used local area network(LAN) technology. 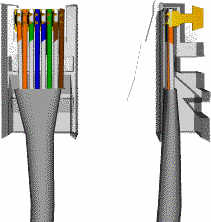 An Ethernet LAN mostly uses an UTP cable. So it is usually called the LAN cable. This cable consists of 4 twisted pairs of metal wires(that means there are 8 wires in the cable). Adding RJ45 connectors at both ends of the UTP cable, it becomes a LAN cable we usually use. Ethernet(10/100Mbps) communications only utilize two pairs. A straight(1:1) cable is used to connect a LAN device(for example ezTCP, PC) to a hub. A crossover cable is used to connect a LAN device to a LAN device without hub.